I was better prepared this time. I had a feeling the beginning would feel a little disjointed but then everything would suddenly come out and it would be wonderful. I was ready. And The Dream Thieves did not disappoint. Things are different for the group now. Their roles aren’t as defined and no one really knows what that means for their quest or their friendships. Tensions are rising, secrets are coming out, and the truth is getting muddled. Blue is still in a sort-of relationship with Adam, but her feelings about Gansey are getting confusing. Ronan has demons to face and a secret that could get him in trouble. Gansey is empowered by the successes of their quest, but unprepared for the failures. All of this is only made more important by the arrival of people searching for the same thing the raven boys and Blue are looking for. Something I am really enjoying about this series is the slow build. Not everything has to happen right away. Things take their time unfolding, letting the idea grow before coming to fruition. Blue and Adam are a friendship, but maybe more, but Blue won’t let herself fall for any boy, even though Adam tries. Blue and Gansey are building a friendship build on trust and respect, even as things start to get confusing for them. Even Blue and Ronan are finding a groove in their relationship. Things aren’t perfect, of course, but it all feels real. Nothing is forced in these relationships and that’s refreshing to read. I feel like The Dream Thieves is more of Adam and Ronan’s stories. Adam is trying to find a way to be equal in the group and Ronan is trying to find a way to deal with the truth. Adam has always felt like less than because he doesn’t come from money like the other boys. He’s had to work for everything, he’s had to think about how his actions affect others, and he’s had to make choices for himself that he didn’t want to. It’s left him feeling unequal in the circle of friends. 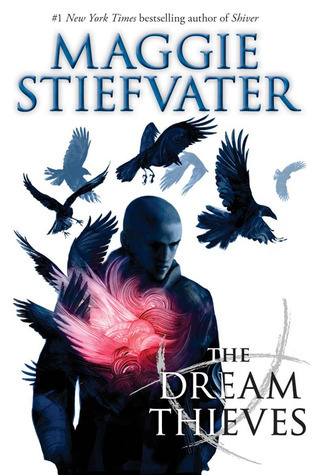 In The Dream Thieves, he finds what makes him equal. Ronan has carried a secret with him and now it’s threatening his way of life. He doesn’t understand what he is or how he affects the world. He’s blown off this secret any way he can, until it finally gets free and he must face it. He has to find a way to accept what he is and learn how to control himself. His struggle was fascinating to read and it really explains a lot about his character. The Dream Thieves is a superb follow-up to The Raven Boys that only deepens the mystery. It will have you on the edge of your seat and holding your breath. Things are only just beginning and the wait for the next novel feels so incredibly long. There’s so much story left to tell. Thank you to NetGalley and Scholastic Press for an advanced copy of the novel in exchange for an honest review. This entry was posted in Mystery, Thriller, and Suspence, Something a Little Different, The Must Reads, Young (and New) Adult and tagged Fantasy, Maggie Stiefvater, Must-Reads, Mystery/Thriller, Paranormal, Supernatural, Suspense, Young Adult.